B. Karthik L, Sujith, B. , A, S. Rizwan, and Sehgal, M. , “Characteristics of the Ozone Pollution and its Health Effects in India”, International Journal of Medicine and Public Health, vol. 7, no. 1, pp. 56-60, 2017. N. Shakthivel, Amarnath, V. M. , Ahamed, F. , Rath, R. Shankar, Sethuraman, A. Raj, and Suliankatchi, R. Abdulkader, “Level of Perceived Stress and Coping Strategies Prevailing Among 1st year Medical Undergraduate Students: A Cross-sectional Study from South India”, International Journal of Medicine and Public Health, vol. 7, no. 2, pp. 111-115, 2017. A. Arvind Vyankatesh, Bharat, P. Sandip, and Kush, A. , “Prevalence of Asthma in School going Children of Semi-Urban Area in the State of Madhya Pradesh”, International Journal of Medicine and Public Health, vol. 7, no. 1, pp. 37-40, 2017. 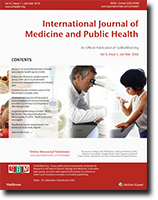 K. Russell Coelho and Belden, C. , “A Systematic Review of the Literature on the Relationship between Caste Membership and Health-Related Risk Factors in India”, International Journal of Medicine and Public Health, vol. 6, no. 2, pp. 61-68, 2016. K. Kuppusamy and Rajarathinam, M. Kumari, “Tracking progress towards health related millennium development goals in India”, International Journal of Medicine and Public Health, vol. 5, no. 4, pp. 254-258, 2015. V. Tiwari, Shukla, P. , and Gupta, G. , “Changing trends of breast cancer awareness in young females of north India: A pilot study from a rural cancer hospital”, International Journal of Medicine and Public Health, vol. 4, no. 1, p. 65, 2014. R. Kamath, Sanah, N. , Machado, L. M. , and Sekaran, V. Chandra, “Determinants of enrolment and experiences of Rashtriya Swasthya Bima Yojana (RSBY) beneficiaries in Udupi district, India”, International Journal of Medicine and Public Health, vol. 4, no. 1, p. 87, 2014. S. Agrawal, “Frequency of consumption of specific food items and symptoms of preeclampsia and eclampsia in Indian women”, International Journal of Medicine and Public Health, vol. 4, no. 4, pp. 350-353, 2014. S. Kotian, Sharma, M. , Juyal, D. , and Sharma, N. , “Intestinal parasitic infection-intensity, prevalence and associated risk factors, a study in the general population from the Uttarakhand hills”, International Journal of Medicine and Public Health, vol. 4, no. 4, pp. 422-425, 2014. R. V. Baradol, Patil, S. V. , and Ranagol, A. , “Prevalence of overweight, obesity and hypertension amongst school children and adolescents in North Karnataka: A cross sectional study”, International Journal of Medicine and Public Health, vol. 4, no. 3, pp. 260-264, 2014. P. Agrawal, Gupta, K. , Mishra, V. , and Agrawal, S. , “Awareness on causes, consequences and preventive measures of obesity among urban married women in India”, International Journal of Medicine and Public Health, vol. 3, no. 4, pp. 293-302, 2013. R. Singh, “Childhood Obesity: An Epidemic in Waiting?”, International Journal of Medicine and Public Health, vol. 3, no. 1, pp. 2-7, 2013.